Found 8 file extension associations related to Schedule+ and 7 file formats developed specifically for use with Schedule+. 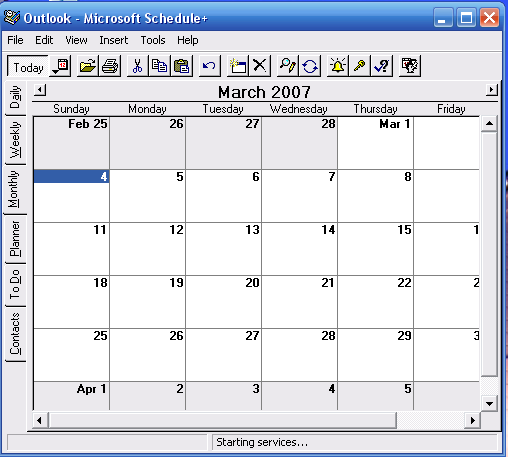 Microsoft Schedule Plus (or Microsoft Schedule+) was a time-management software product by Microsoft, but was discontinued as part of Office when its functionality was incorporated into Outlook 97. It was originally intended as a companion to Microsoft Mail, but later it was a companion to Microsoft Exchange and was part of Microsoft Office 95, and later Microsoft Exchange Client and Windows Messaging, so it was later included and developed as part of Microsoft Exchange Server, which resulted in version 7.5 of Schedule+ as part of Exchange Server 5.0. The "Outlook Calendar" that was part of Outlook for Windows 3.1 and Macintosh versions before 9.0 was actually a new version of Schedule+. In spite of being discontinued, the software, however, is still included with all versions of Microsoft Office up to Microsoft Office 2003, although it is just to support conversion from Schedule+ 1.x. It is not available in Office 2007, though was present in early test builds. The Schedule+ software seems to be old or discontinued. If you need more information please contact the developers of Schedule+ (Microsoft Corporation), or check out their product website.